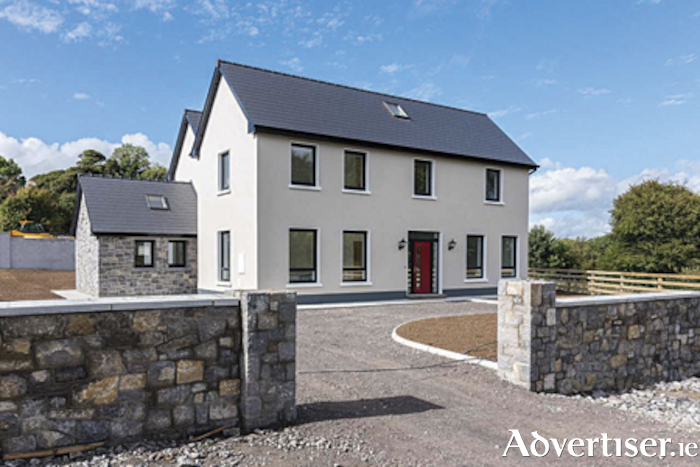 Introducing a large new detached four bedroom house sitting on 1/3 acre site in the attractive village of Lecarrow with its picture-esque harbour fronting onto Lough Ree. Block cavity wall construction, the house is airtight sealed with hollowcore flooring. Insulated to an extremely high level with triple glazed windows and a heat recovery and air handling system to include a high performance 12Kw air source heat pump central heating system with Hive controls, the property also boasts underfloor zoned heating both downstairs and upstairs. A solid fuel wood burning insert stove also features. Feature ceilings are complete with LED lighting with an oak stairs also detailed in the property. Externally, there are landscaped gardens with a tarmacadam drive and natural stone walls. Fully painted both inside and outside, there is an Efibre internet connection. With a €10,000 kitchen allowance and €2,000 wardrobe allowance, the help to buy grant of €19,500, is also applicable to the property. Price for this ideally located property, net of the grant is €370,500. Agent for this property from Sherry Fitzgerald O’Meara is Helena Kenny. To arrange viewings or for more information call 0906475500 or email [email protected].